Posted 6/6/2018 3:47pm by Jeff Schrimmer. We are getting excited about our first delivery date of the 2018 season. Farmer John has informed us that the start date will be June 13th due to the weather conditions he has been experiencing. We are moving our pick up location to Sussex and Van Vorst Streets. It is two blocks from our original location of 120 Sussex Street and once we are settled in, we will inform you of the exact address prior to the first delivery. Save the date for our annual farm day the weekend of June 23rd and 24th - more details to follow. I hope you had a pleasant Memorial Day weekend. I apologize that I have not been able to get a farm update out to you until now. It has been a very difficult spring for us here at the farm. I am sure that most of you noticed that winter hung around well into April this year. We still had snow flurries flying on April 13! As a result we were unable to begin planting until Mid- April; about 2 weeks later that normal for some crops. In addition the cold soil caused poor emergence in some of the early direct seeded crops such as peas. We worked diligently to get caught up with our spring planting and had largely succeeded. We were then a bit behind on setting out some of the warm weather crops. We were getting caught up on these when we had a week of rain, including a strong storm which ripped the plastic off one of our high tunnel greenhouses and knocked power out for three days! We are now back on track and continue to work hard to ensure a bountiful season. Unfortunately the delayed start and slow plant growth we experienced has caused delayed maturity of most of the early crops. We simply will not have a sufficient number of items to make a delivery worthwhile at present. The original plan was to start deliveries during the week of June 3rd, next week. We will have to postpone the start of the season until the following week, June 10th. Farming is an endeavor replete with challenges and setbacks. In so many ways we are at the mercy of the weather. As veteran members know, we do not give up. We roll with the punches and keep moving ahead. In 15 years of CSA farming this is the first time I have needed to delay the start of the season and it is very disconcerting for me to do so. The early shares are always somewhat small and we will do our best to make up for the missed week during the rest of the season. I thank you for your patience and understanding. The Farm visit will be held on Saturday, June 23 with Sunday June 24th as a rain date or for those who cannot make it on Saturday. Save the date! I will have more info out about this event and other opportunities to visit the farm and help out as a volunteer in the near future. The start of the 2018 season is nearly here! Posted 5/30/2018 12:05am by Jeff Schrimmer. The first pickup is scheduled for Wednesday, June 6 from 5:30pm to 8:00pm at our pickup location on Sussex St. Despite recent rains that made Farmer John's fields too muddy for tractors and other large equipment for days, he and his staff are getting things done. We should be getting an update from John soon. Membership is up this year, but we still have room for more! Please tell family and friends about us, and let us know if you would like copies of promotional materials. We need to have accurate numbers for the farmer, so if you have not yet sent us payment for membership, please do that as soon as possible. We will also send out payment reminders, soon. 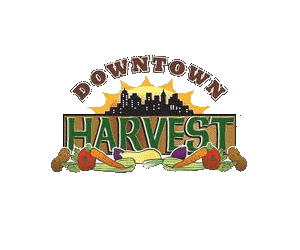 Please e-mail us at downtownharvestcsajc@gmail.com if you have questions or if you do not intend to send payment due to changes in plans. Posted 4/23/2018 7:46pm by Jeff Schrimmer. Hi Folks, Happy Earth Day! Although I’m not really sure that the happy part is appropriate. It’s hard to believe it’s been nearly 50 years since the first Earth Day. While progress has been made on some fronts we still face many challenges. Our oceans are in dire trouble, the species extinction rate is a thousand times higher than the normal background rate, greater than at any time since the dinosaurs went extinct. There are millions without access to safe drinking water and we are recklessly threatening our water supply further by fracking. And climate change, the single biggest threat to human survival (beside thermonuclear war) continues to be denied and ignored by our government. There is an obvious need for political change but we are so polarized as a country that it’s hard to see the path forward in this regard. For me, for now, the only recourse I see is individual action. We all need to try to change our lifestyle in a way that that reduces our impact on the environment, leading by example toward becoming responsible global citizens. Agriculture is one of the largest sectors contributing to environmental deterioration and energy consumption that contributes to greenhouse gas emissions and climate change. Our industrialized food system and the long distance transportation of our fruits and vegetables needs to change. But while agriculture is a part of the problem it also has the potential to be a big part of the solution. When I first became interested in organic farming it was because I believed we needed to learn to grow food without the use of toxic chemicals that not only poison the consumer but also proliferate in the environment and pose a threat to other species. As time went by I came to believe that organic Ag had a role to play in the battle against climate change by maintaining high levels of organic material, i.e. carbon and keeping it out of the atmosphere. High organic matter has many benefits to the soil; better water retention, less compaction and slowly released nutrients to name just a few. Research over the past several decades has now demonstrated what organic enthusiasts have believed for years is true- that the soil is a living entity; a microbiological ecosystem. A healthy, balanced soil produces healthy plants and when the system is disrupted, bad actors (bacteria, fungi etc.) take over causing disease. In conventional farming this then leads to use of more toxic chemicals to control the disease and further degradation of the ecosystem. This is very similar to the understanding that we have come to have regarding the microflora of our gut and it’s relation to human health. The implication for the carbon cycle is that this soil food web ties up lots of carbon in the bodies of the microbes (and larger animals like earthworms) and keeps it out of the atmosphere. The Rodale Institute has been researching the carbon cycle for decades and is convinced that transition to organic farming practices and proper grazing of animals can not only account for current carbon emissions but actually begin to reduce CO2 levels in the atmosphere. A new paradigm for farming has emerged and has been dubbed Regenerative Agriculture. Through cover cropping, re-mineralization, composting and reduced tillage we can restore our soils and begin to mitigate the deleterious effects of CO2 and other greenhouse gases on the atmosphere. This is what we will be moving towards here at Circle Brook Farm. It is not easy; it requires new equipment, more fallow time for the fields, additional expenses for cover crop seed and rock dusts and most of all the courage to abandon tried and true practices and risk failure by implementing new planting systems. For these practices to be implemented on a wide scale local organic farmers need the support of consumers. If you are already a CSA member I thank you and if you are still reading this lengthy tome I thank you for that as well. If you are thinking of joining the CSA program I hope you will. But if you cannot, please seek out local organic produce at a farmer’s market or demand it at your local grocery store. Please do not buy over packaged meal kits that don’t contain local produce. Please help to spread the message. Word of mouth is the most powerful advertising we have. Please take the time to speak with your family and friends about the importance of eating local and organic and share the message on social media. For your health and the health of the planet! Posted 3/8/2018 7:39pm by Jeff Schrimmer. 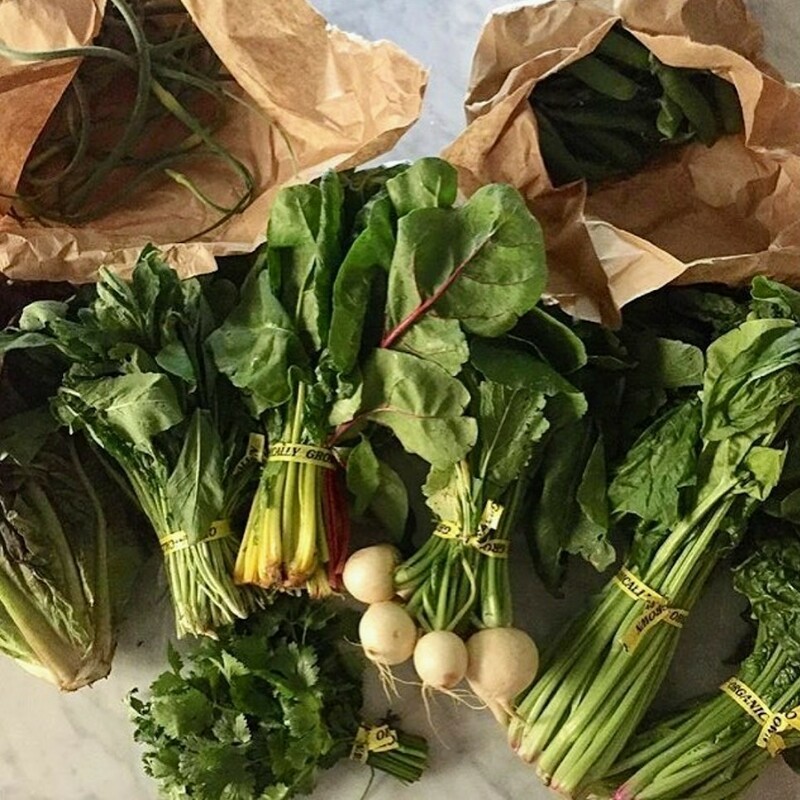 Based on your feedback, Downtown Harvest CSA will offer pre-boxed half shares this season as an alternative to "splitting" full shares with partners. “Grab your box and go” will be an attractive option for people who want a convenient way to purchase less than a full share. The fee for a pre-boxed half share is $400 for the 24-week season. While past performance is no guarantee of future performance, a half share in 2017 was around 200 pounds of high quality organic produce, and that was a typical season. Full shares ($675) will remain "market style", in which members pick and choose from bins and crates. Members are still welcome to "split" shares as pairs or groups as many have done in the past but this year with only 1 admin fee for the pair or group. Our weekly pick up spot will remain at 120 Sussex Street in Jersey City. Thank you Father Bryan and OLC for providing us with a home. And, as in past years, food that is not picked up will be given to the Our Lady Of Sorrows food pantry. Posted 2/13/2018 3:01pm by Jeff Schrimmer. Last spring Circle Brook Farm built a “chicken tractor”- a mobile chicken coop used for raising birds on pasture. They acquired a flock of laying hens; Rhode Island Red crosses, and by mid summer the flock was in full production. Egg shares became available to our members, and the eggs were fantastic, which was no surprise to fans of Farmer John's work. The birds are generally outside all day, where they feed on the grass and other plants and insects as well as the vegetable wastes which the farm generates. The birds spend the night on roosts inside the chicken tractor protected from predators. Their foraging diet is supplemented with milled grain that is locally sourced and non GMO. John has not yet been able to find a nearby source of organic feed in the quantities he requires. John's Rhode Island Reds have continued producing wonderful eggs this winter, allowing us to offer winter/spring egg shares. Egg share members have been picking up eggs every two weeks since November, and this will continue until May 23. If you are not a winter/spring egg share member but might be interested, please e-mail us at downtownharvestcsajc@gmail.com. Egg shares will be available to produce share members during our June to mid-November 24 week season for the following fees: $120 for 24 weeks of 1 dozen/week, $220 for 2 dozen/week, and $320 for 3 dozen/week. Enrollment is now open for the 2018 Season! Posted 2/10/2018 5:27pm by Jeff Schrimmer. Downtown Harvest CSA is thrilled to announce details of our 2018 season, our 14th year of bringing healthy New Jersey food to our urban community. We will be adding new options to our offerings this year. 1) Farmer John Krueger, our farmer for more than a decade, will continue to be our farmer. 2) The 24-week season will begin in early June and will end in mid-November depending on weather and growing conditions. 3) The price of a full share will remain the same as in 2017: $675 for a full share. Members who enroll before March 1 will receive a $25 discount, reducing the fee to $650. 4) Members who purchase produce shares will have the option of purchasing egg shares. The fee for 1 dozen eggs/week will be $120, 2 dozen/week for 24 weeks will be $220, and 3 dozen/week will be $330. 5) We will continue to use “market style” distribution for full shares, in which members choose items from bins and may be offered choices of items. Our popular "exchange bin" will be there, again, so you can exchange items you may not need for others that you want. Items that are not picked up will be donated to the Our Lady of Sorrows food pantry in addition to shares generously donated by our members and our farmer. 6) Groups of people who wish to split shares will no longer need to pay additional administration fees for each member of the group. One person will sign up for the group, insure that payment is made, and list the names of people authorized to pick up when you fill out the enrollment information on the website. How you do your splitting is up to you. 7) Based on your feedback we will offer pre-boxed Half Shares as an alternative to splitting shares with partners. “Grab your box and go” will be an attractive option for people who want a convenient way to purchase less than a full share‎. The pre-boxed share is $400 for the 24-week season. Members who enroll before March 1 will receive a $25 discount, reducing the fee to $375. 8) The administration fee for one Full share or one pre-boxed Half share will $25 for the 24-week season. 9) Last season’s members will not automatically be re-enrolled. We hope you wish to be a part of Downtown Harvest in 2018, and we ask you to visit our website and enroll for the 2018 season. Notes: after enrolling for the 2018 season, members will receive payment instructions (enroll first, pay later). Payment must be made by check. However, we cannot provide refunds, so please be sure of your commitment before mailing or dropping off checks. We are looking forward to another great 24-week season and encourage you to take advantage of the early enrollment discount! Posted 11/13/2017 11:47pm by Jeff Schrimmer. So we have arrived at the end of another CSA season; a sad time for many of you and perhaps a relieve for some of you as well. I know that it sometimes a challenge to put to good use all of the produce you receive in your share each week. We try to give a good value but sometimes we overwhelm. We have tried our best to provide variety and quality and I believe for the most part we were successful. In any growing season there are challenges and disappointments; this year it was with the tomatoes and to some extent the melons. Both of these were the result of a wet summer. For next season we will be constructing more high tunnel greenhouses to grow tomatoes where they are protected from wet conditions. We have a few of these now and were continuing to harvest a few tomatoes each week for market but never enough to ship to members, at least until last week when we suddenly had a preponderance of ripe fruit. We sent a few out to several groups and will be attempting to cover the rest this week. For me and my crew the season is ending none too soon. We have been enduring cold wet conditions for several weeks and this past weekend’s polar blast wreaked extensive damage on the crops remaining in the field. My worker tried valiantly to either pick or protect what we could but in the end time ran out and the temps dropped to low (16 degrees). I would have liked to have finished out the season a little stronger but it is what it is (as the say!). Of the greens, spinach is about the only thing that survived the cold. Arugula and the other mustard family crops were not killed but are too badly damaged to cut. Some of these will recover and continue to grow so we hope to have some in the stock up share for next week. I have tried to make the updates informative and humorous and tried not to complain about the weather in every single one (I believe I succeeded once or twice). You know what they say- everyone complains about the weather but no one ever does anything about it. But the weather is different than the climate, even though the climate change deniers have difficulty grasping that fact (among many). We are all able to do something about climate change by the way in which we live our lives. Supporting local farms and reducing the transportation impact of our food is one of those ways and I thank you for that. Agriculture has a tremendous impact on the global environment and a huge role to play in our planets restoration. But as we strive to be good stewards of the land, to be restorative and sustainable we are still faced with the ultimate challenge- economic viability. Faced with declining CSA membership and farmers market revenues we have had to attend more markets with less profit. This year even the small wholesale component of the business has faltered, presumably because other farmers in the same situation have turned to this avenue to sell their excess produce. As consumers turn to the convenience of meal kits and home delivery services small farmers will be left out of the loop. I love what I do and hope to continue but it’s going to take some creativity to develop a new distribution paradigm as community supported agriculture fades away. In the meantime we need your help to spread the word about the importance of supporting your local farms. Talk to your family and friends about joining a CSA or shopping at the farmers market. If you have time, participate in the core group at your site and help us figure out what the impediments are to joining a CSA and what might be the solutions. Thank you all for your support. Please thank the core group organizers at your site for all that they do. I wish you all Happy Holidays and a safe and healthy winter. The share for this week will be: Carrots, spinach, potatoes, onions, beets, sweet potatoes, leeks, butternut squash and Brussels sprouts for those who did not receive them last week. There will be celery for the premium shares. Posted 11/6/2017 9:38pm by Jeff Schrimmer. So We’ve enjoyed a very mild fall thus far but it seems that is about to end. We are expecting frost every night this week and temps are forecast to dip into the teens on Friday night. This is quite worrisome as temperatures that low can damage even the hardiest of crops. We are going to have to harvest a lot of stuff ahead of the deep freeze and cover whatever we can that is left in the field. We will be trying to get some Brussel’s sprout out to some groups this week and to others next week in the final share. These are tremendously time consuming to harvest; made even harder because the outside leaves are a bit damaged and my workers have been painstakingly peeling them. I’m afraid we may need to curtail this endeavor and ask you to pull one or two of the outside leaves off at home if they are not pretty. We are sending Yacon (pronounced jacone) this week in the premium shares; it is a tuber that is in the sunflower family. It is native to South America. I brought some roots back from Colombia a few years ago and we have been expanding our planting stock. The look just like sweet potatoes, but are best eaten raw, so don’t confuse then. They are sweet and juicy and can be chopped up and added to salads. They are a light orange color and taste a little like carrots. They keep very well but begin to turn black rather quickly after they are peeled. At the farmer’s market in the mountains outside Medellin, where I discovered them, they kept the peeled pieces in a glass of water. Posted 10/30/2017 6:22pm by Jeff Schrimmer. So we received 4 inches of rain from Sunday’s big storm. We lost power around 8:30 just as we were sitting down for dinner. Power was restored at around 2 AM. We still maintain a considerable amount of produce in the walk-in coolers, so it is always worrisome to experience an outage. Fortunately it was brief and we did not suffer any damage form the high winds. We have some very muddy conditions in the field to contend with but all in all very lucky to have been spared the damage that has befallen much of New England. I have come to accept worrying as an occupational hazard of farming. One of the first songs I ever learned on the guitar was “Worried Man Blues” an old folk song popularized by the Carter family (and covered by just about every folk and bluegrass artist). I didn’t know back then just how well it would serve me! The cauliflower is still abundant and the next planting of broccoli will be heading up soon. Brussel sprouts will probably have to wait until the final delivery of the season and of course there will be some in the stock up share (hint, hint). Apparently I told a fib last week when I predicted the end of the peppers as we still have a few for you this time around. The sweet potatoes this week will be a variety known as Jersey’s or white sweet potatoes. The winter squash will be an assortment of delicata, sweet dumpling and Jester (a cross between the first two). It will be another colorful share with orange carrots, yellow onions, redskin taters and lots of greens. The share for this week will be: Lettuce, potatoes, spinach, choice of kale or chard, sweet potatoes, carrots, peppers, choice of arugula, broccoli raab or tatsoi, onion, cauliflower and delicata/ sweet dumpling/ Jester. Premium shares will receive celery root and either salad turnips or radish/daikon. Posted 10/25/2017 3:44pm by Jeff Schrimmer. So a week after our frost event we are seeing the damage that was caused. It seems bit strange but while the peppers and beans were not completely killed, we had damage to some crops that are usually quite hardy. Lettuce which is much tougher than one might think had quite a bit of tip burn as did the chard. Even the broccoli and the kale have some white spots on the leaves- a sign of frost damage. I’m guessing that it’s because the cold came somewhat suddenly and the plants did not have time to prepare. Plants adapt to cooler temperatures by producing compounds, primarily sugars that act as anti-freeze and protect their cells from rupturing. The rupture is the result of a strange property of water. All other materials contract as they get colder; and so does water at first; right down to 4 degrees and then it begins to expand. We have another nice share for you this week. We have a few more peppers for you (mostly green) and with these we bid farewell to the warm weather crops. Now that the sweet potato vines have been thoroughly blackened we have begun harvesting them in earnest. We have a tremendous crop and you will be enjoying them for many weeks to come (especially if you purchase the stock up share! nudge nudge). We are sending spaghetti squash as the winter squash du jour (du semaine?) partly because people seem to like it and partly because we have a lot and it doesn’t keep well for us. The share for this week will be: Peppers, potatoes, spinach, choice of arugula with either tatsoi or broccoli raab, cauliflower or cabbage, leeks, bok choy (purple), spaghetti squash, beets and sweet potatoes. Premium shares will also receive daikon and choice of endive or escarole.